Bates was a track as well as football star in college and won a bronze medal in the 200-yard dash at the 1992 Olympic games. A sixth-round draft choice of the Seattle Seahawks in ’92, he delayed his pro debut until 1993 as a result of his Olympic participation. Used as a blocking fullback in college, Bates was shifted to wide receiver by the Seahawks, but he rarely saw action on offense. In two seasons with Seattle, he returned 56 kickoffs for a 19.8-yard average while catching a total of six passes, one for a touchdown. He was also good on kick coverage, but three concussions suffered in 1993 raised concerns. Waived by the Seahawks, he spent 1995 with the Browns before being dealt to Carolina. Panthers went 12-4 to finish first in the NFC West in just their second season while leading the NFL in kickoff return average (26.2). Won NFC Divisional playoff over Dallas Cowboys (26-17). Lost NFC Championship to Green Bay Packers (30-13). The outstanding performance in 1996 marked the first of five straight seaons in which he was selected to the Pro Bowl. Bates again led the NFL in kickoff return average in 1997 (27.3), and in his five years in Carolina returned 233 kickoffs for a 25.7-yard average and five touchdowns. Left unsigned after the 2000 season, he moved on to Washington in ’01 where he averaged 23.5 yards on 49 returns and was cut. Returning to the Panthers for 2002, Bates suffered an injury during the preseason that put him on injured reserve for the year and, after stints with the Jets and Cowboys in 2003, his career came to an end. Overall, he averaged 24.4 yards on 373 kickoff returns, was a consensus first-team All-NFL selection once, received at least some All-NFL or All-NFC consideration after four other seasons, and gained selection to the Pro Bowl five times, noted for both his kick returning and kick coverage. 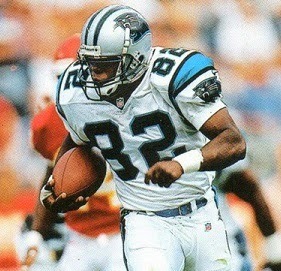 He was named to the 1990s All-Decade team by the Pro Football Hall of Fame.